Mining of cryptocurrencies is a great way to get a passive income with minimum efforts. NuVoo Mining is one of the services to do that. The company is officially registered in 2017 in Cyprus under the name NuVoo TM or G.O. Great Offers Direct Ltd. It has the main office in Quebec, Canada. This a legit cloud-based service offering optimal solutions for both novice users and professionals. The company website works 24/7 and the customer support is available in both English and French. Here, you can mine such top cryptocurrencies as Bitcoin, Ethereum, and Litecoin using the SHA256, Scrypt, and Ethash algorithms, respectively. It is noteworthy that no matter what cryptocurrency you are mining, the profit will be counted in Bitcoins. This is done in order to minimize the possible risks because BTC is the most popular cryptocurrency, which will most likely grow in value. 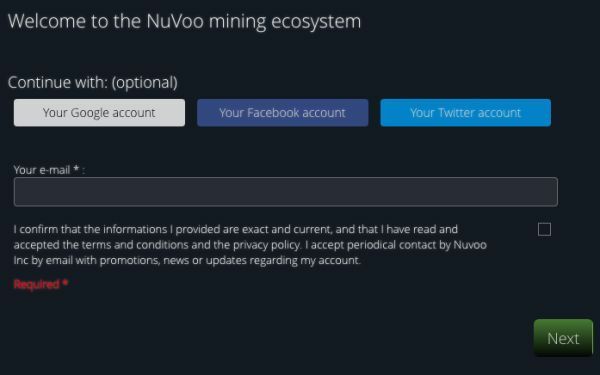 The NuVoo Mining server offers many opportunities for beginners or those who wish to maintain their growth in the cryptocurrency business. Clients of NuVoo Mining can choose several options for getting profit from several server offerings: cloud mining, client farms on dedicated hosting, and mining collocation, with which the hardware is used by several users at once. NuVoo also offers the development of a unique program for creating own farms with cost-effective solutions for both newbies and professionals on the cryptocurrency market. In the registration form, you have to specify the following data: language (English or French), name, surname, country and city, and your email address. In addition, you can, but do not necessarily mention a phone and a company if you are a legal enterprise. To complete the registration, you need to come up with a username and a password for your account. After registration, it is necessary to top up your account for purchasing capacities. You can do it using the bank card, Bitcoin wallet or bank transfer. Also, there is an opportunity of an alternative registration using Facebook or Twitter accounts. Then, you are able to purchase the first cloud mining contract in just two clicks. The company server location in the cold tundra region of Quebec with the low cost of electricity determines the relatively low cost of the minimum contract – $ 66.7. The company offers 4 contracts of lifetime duration for mining: Starter, Bronze, Silver, and Gold. The Starter mining contract costs $ 66.7. 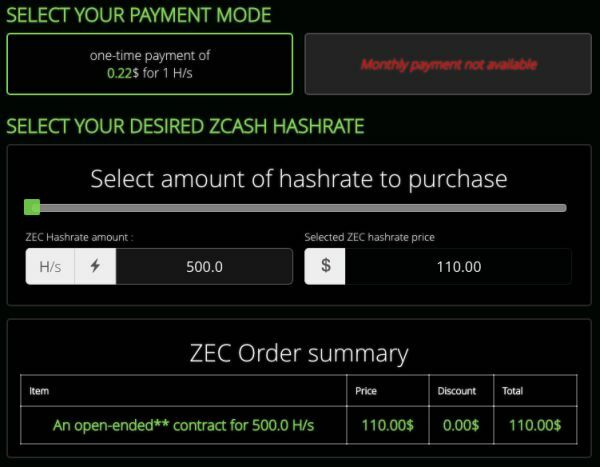 This package includes a power of 621.95 GH / s.
The Bronze rate is $ 200 per 1,865.87 GH/s. 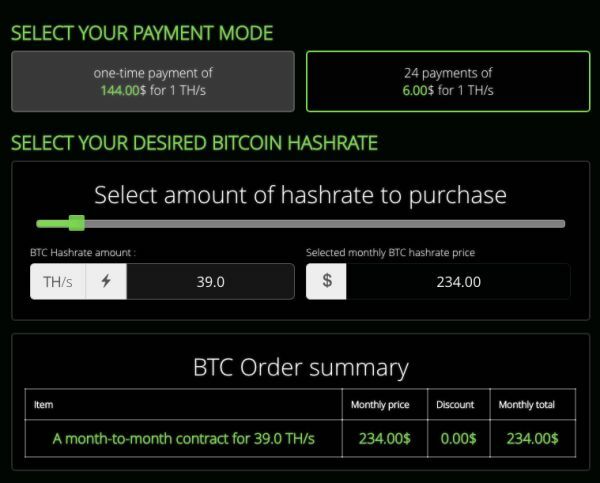 To buy a Silver package that provides a power of 3731.76 GH/s, you will need to pay $ 400. The Gold package costs $ 800 and gives 7,463.53 GH/s. NuVoo Mining also has a profit calculator on the website to inform clients about how much money they will make with each mining contract. In each package, all related mining fees are already taken into account, including the expenses on the electricity, hardware cooling, maintenance, and hosting. Additional charges for customers are not charged. The HVAC cooling system has been specially developed for cryptocurrency mining. It is very cost-effective and environmentally friendly. Unfortunately, there are fraudulent companies among the present cloud mining services that operate on the principle of financial pyramids. As a rule, such companies promise very high incomes and hide details of their activity from clients. NuVoo, on the other hand, makes its work transparent and even allows its clients to monitor live the data center using webcams. This demonstrates the honesty of the company and ensures the customer’s trust. NuVoo company offers a partnership on the White Label scheme. With it, the client creates its own mining center with the full support of NuVoo. According to the term of the partnership program, each registered customer gets a referral link, which can be shared in social networks and with third-party websites. Each invited user brings to the owner of the link a 10% bonus from all purchases. The company developers offer ready-made solutions for cloud mining business: cost calculation, computing power, mining pools, and project promotion on the market. The service periodically arranges promotions to reduce prices for available packages. The withdrawal of funds can be done after the first payment of the contract and upon reaching the minimum amount – 0.00200000 LTC, BTC or ETH. Payouts are possible daily. Also, you can spend earned crypto money for the purchase of additional contracts and power. Usually, clients claim withdrawals to Visa/Mastercard or to Bitcoin wallet. The current clients usually denote the good convenience of NuVoo withdrawal service. 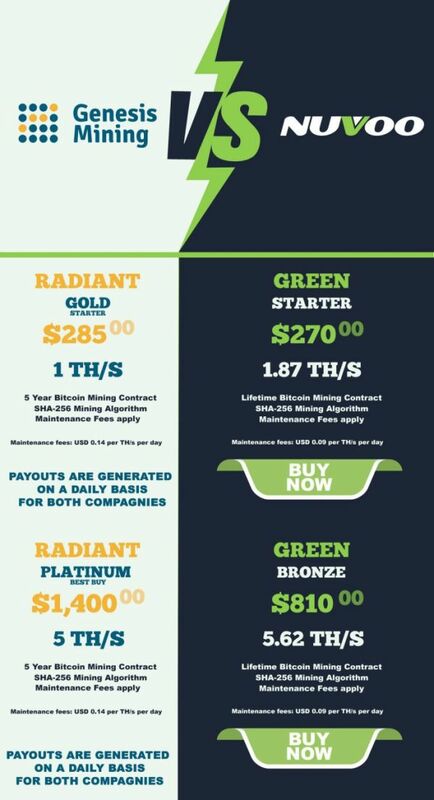 Most often, miners prefer to use the proven services as HashFlare or Genesis Mining. First of all, it is to note that HashFlare offers contracts for 1 year, while NuVoo contracts are unlimited. This means that you can mine cryptos with Nuvoo for as long as your plan remains profitable. When the contract does not bring the profit anymore, NuVoo Mining stops operations with it. We should also accept the fact that the profitability of mining depends on the current rate and the complexity of mining a cryptocurrency. The significant advantage of NuVoo is that the company does not charge clients with maintenance and electricity fees. Apparently, HashFlare offers more options to invest, but not all contracts are available. Let’s compare several items of these two services. NuVoo Mining – $ 199 per 527.08 GH/s. HashFlare – $ 1.8 per 10 GH/s. NuVoo Mining — $ 125 per 15. 75 MH/s. HashFlare – $ 4.2 per 1 MH/s. NuVoo Mining – $ 369.99 per 10.00 MH/s. HashFlare – $ 2.2 per 100 KH/s. The NuVoo service has mostly a positive feedback on forums, and this is a good indicator. Most people confirm trouble-free earnings and withdrawals on NuVoo Mining. The NuVoo contracts have competitive pricing. There are multiple choices for anyone in finding the right contract. The company is considered as one of the leaders in cloud mining thanks to its patented software, skillful algorithm management, and round-the-clock expert support. Thus, NuVoo is a reliable company which has managed to attract a big number of clients to its community, who are currently active miners.